Changing booking dates? Tell guest & 3rd parties automatically. It's easy to change the dates for a booking, but up until now, nothing has automatically alerted the guest that the change successfully occured. You had to send a manual email to the guest after the fact. You also had to manually email your third parties - the housekeeper, manager, etc - so that they were kept up to date. Making a simple date change meant having to remember who you needed to notify and having to write out manual emails to keep everyone on the same page. Now, OwnerRez does all that for you. 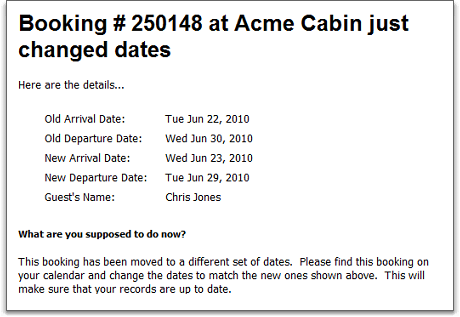 Open a booking, navigate to the Dates page and click the Change button. Right away, you should notice the new Email Options section that shows under the calendar strip. By default, all three email options are selected since most of the time you will want to notify everyone. If you don't want an email going to the guest telling them that their dates changed - perhaps you told them already - simply deselect that option. Likewise with the third party or owner notifications. The format and layout of the automatic emails are the same as the others you're used to seeing in the system. The guest gets a clean message that reminds them what the dates originally were and confirms that the change has been made. Third parties get a message that not only tells them the old and new dates, but also summarizes what they are supposed to do. As it says in the title of the Email Options section, these automatic emails can only be sent at the time the change is made. In other words, if you deselect one or more of the email options and click Save, you cannot send the automatic emails at a later time.